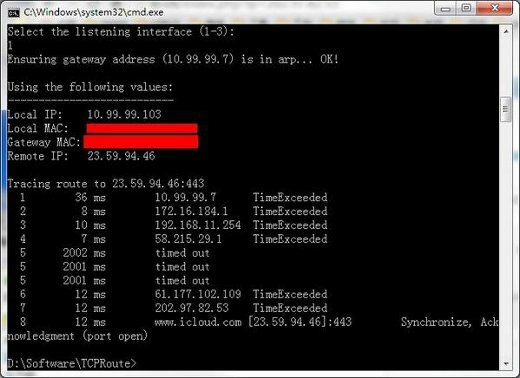 Users in China are reporting a MITM attacks on SSL connections to iCloud. This is clearly a malicious attack on Apple in an effort to gain access to usernames and passwords and consequently all data stored on iCloud such as iMessages, photos, contacts, etc. In their blog post GreatFire also linked a packet capture file, which we have analyzed in order to verify the MITM attack. We loaded the PcapNG file into NetworkMiner Professional and extracted the X.509 SSL certificate. As reported elsewhere, the certificate was self signed, which means that browsers and most iPhone apps will either inform the user about the connection being unsafe or simply close the connection (see update at the bottom of this blog post regarding the missing certificate verification in Apple iOS). This use of self signed certificates is consistent with previous SSL MITM attacks performed in China against GitHub, Google, Yahoo and live.com. By looking at host the information provided by NetworkMiner for the fake iCloud SSL server we can see that it is just six router hops away from the client (having an IP TTL value of 58). This indicates that the MITM attack is being performed within China, since we'd expect to see at least three more router hops if the packets were coming from outside China. The same PCAP file also contains packets from the same IP address on TCP port 80, which have traveled 11 hops (IP TTL 53). We therefore assume that only traffic to TCP port 443 is being MITM'ed. This TTL analysis also matches various TCP traceroutes we've seen to the MITM'ed iCloud SSL service on 23.59.94.46:443. The mtr TCP traceroute above indicates that MITM attacks are performed in AS4134 (China Telecom). The tcptraceroute above indicates that MITM attacks are also performed in AS4837 (China Unicom). The Tcproute screenshot above shows that also CHINANET backbone network (China Telecom) seems to be used to carry out the MITM attacks. Judging from these TCP traceroutes the MITM attacks seem to be taking place at several different locations rather centrally in the Chinese Internet infrastructure. To be more specific, it appears as if the MITM attacks are being performed on backbone networks belonging to China Telecom (CHINANET) as well as China Unicom. iCloud Data Access in Apple iOS before 8.1 does not verify X.509 certificates from TLS servers, which allows man-in-the-middle attackers to spoof servers and obtain sensitive information via a crafted certificate. This means that the Chinese MITM of iCloud could potentially have revealed a significant number of iCloud credentials as well as private data (images, videos, documents etc) to the attackers. Or, as @Exploit_This tweeted: "So china wants our nudes?"